As usual, there has been a lot going on backstage in my life. Little hurdles have been placed here and there for me to jump. I try to go around but have been told that I cannot proceed any further unless I am successful in jumping over them. So, I am currently sitting on the track, cross-legged and contemplating the best next move. Ever since YaYa entered Catholic school, his chosen Halloween costume has required a collaboration of HIS imagination and MY sewing skills. I’m sure YaYa would agree that it’s not easy being creative when neither you or your mom has the skill set to support your ideas. Imagine what must have been going through my head when YaYa announced that he and a group of kids at school had decided to all be various cereals. 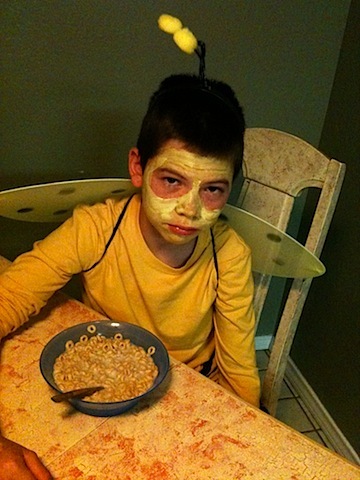 I was somewhat relieved after being able to produce the costume of Buzz, the bee mascot for Honey Nut Cheerios. That is until he gave me this look.